I spent a total of six weeks in Burgundy in 2011. 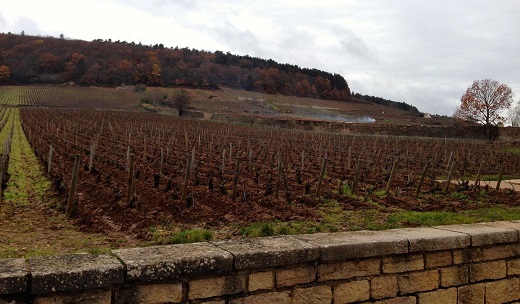 My most recent trip, in late November/early December, was focused on the 2010 red Burgundies. Overall, I am thrilled with the 2010 vintage. The wines are racy, show fabulous minerality and are very true to site. In other words, the vintage embodies all of the qualities that make red Burgundy one of the world’s most compelling wines. To better understand the vintage, it might be helpful to take a closer look at some of the key events of the year. The first of these was a deadly winter frost in December 2009 that killed many plants and wiped out a number of vineyards, especially in lower lying areas that are particularly susceptible to frost. Most of the damage was done to the village level parcels that lie adjacent to or near the Route Nationale. Cold weather during the flowering was highly problematic. In a normal year the flowering takes around a week, but in 2010 it took as long as a month. There was a very high incidence of shatter and shot berries, both of which reduced potential yields dramatically. As we will see later, these would turn out to be blessings in disguise. The vines went into the summer with very light loads. There were very few bunches on the vines, many of those bunches were loose (meaning with few berries) and the berries themselves were small. A cold, damp summer followed, which only served to fray the nerves of producers as they left for their August vacations. At this juncture the expectation for the vintage on paper was very low. The weather improved in September, with a key spell of dry, warm weather in the middle of the month. The harvest began later in the month and stretched into October for some domaines. Growers had to work around rain on September 24, but otherwise there were no major weather events during the harvest. Most growers reported bringing in healthy fruit, which isn’t as surprising as it might seem, given that one of the virtues of loose bunches is that they allow for excellent access to air and sun for the individual berries. There is little question that the naturally low yields were key in allowing the fruit to ripen fully. they added about half a degree of alcohol. Fermentations were slow to start because of the cold ambient temperatures, a theme that would play out again in very slow and protracted malolactic fermentations, many of which did not finish until the end of the following summer. Which brings us to the present. I tasted all of the wines in this article in late November/early December 2011. At the time, many of the wines had never been racked. The 2010s have huge fruit, but also good acidity and finessed tannins. Many growers like to say 2010 has the fruit of 2009 and the structure of 2008. I suppose that is as good a thumbnail as any. Even though the weather was far from ideal, the low crop load allowed the remaining fruit to achieve full phenolic ripeness. The high percentage of shot berries resulted in high skin to juice ratios, which is generally excellent for concentration, structure and potential longevity. Moreover, since shot berries have little or no seeds, the quality of the fruit and tannin is remarkably elegant. There is no question the wines have tremendous transparency to site. At the lower end, quality can be irregular, reflecting the inconsistent quality of village and regional level vineyards. Moving up the hierarchy of sites, the best 1er Crus are terrific, while the finest Grand Crus are more than deserving of their exalted status. The most successful 2010s are nothing less than thrilling. Now for the bad news. Because of the poor weather, yields were down 30-50% on average, so supply of the wines is very limited. With the exception of the most coveted wines, in most vintages there is some availability in the marketplace once the initial hype of the new vintage dies down. Given the minuscule production of the 2010s, this is one vintage where readers will want to snap up the wines as soon as they become available. As the old adage says, there will always be another great vintage, but if 2010 holds special meaning for personal reasons, my suggestion is to move quickly, which is exactly what I plan to do. I also feel compelled to warn readers to rely only on merchants with a strong track record of delivering wine. As explained above, yields are down significantly, which means allocations will also be cut sharply across the board. So, is 2010 a better vintage than 2009? The answers is it depends. In terms of consistency from top to bottom the edge goes to 2009. This is especially true among entry-level wines, a part of the hierarchy that remains one of the true virtues of 2009. Once you start getting into the better 1er Crus and Grand Crus in most cases my preference is for the 2010s because the wines have more energy, vitality and site-specific expression. That said, the finest 2009s remain super-impressive, as noted below. Faced with two vintages of this overall level of quality, it really comes down to personal taste. For what it is worth, I tend to choose domaine first and vintage second when the vintages are of approximately the same level of quality. I had the opportunity to taste several hundred 2009s from bottle during my most recent two week trip in November/December 2011. Those wines will be reviewed in my April article. For now, let me just say that many of the top wines have turned out as good or better than I expected. I was pleasantly surprised to see a number of the top wines beginning to shut down in bottle, which is a very good sign for the potential longevity. The best growers captured the radiance of the year and also maintained the freshness the wines need to age well for years and decades. One of the criticisms of the 2009s is that the wines don’t show a lot of site-specific character. My tastings suggest that, in fact, they do, but that it will take time before those subtleties emerge fully. of love that goes into every bottle, rather than to just the highest bidder. The problem is that Grand Cru Burgundy, especially from top domaines, is now affordable only by a small number of very wealthy consumers around the world. I am not sure I know what the solution is, or if there is a solution. What is quite obvious is that the supply of the best wines from Burgundy is far too small to satisfy the thirst of the world’s consumers. When – and it is when, not if – consumers in emerging markets, Asia in particular, discover Burgundy in a big way, today’s prices will look downright cheap. The good news is that this distortion of pricing is only happening among the most coveted wines, for now. Once you move into 1er Cru wines and below from anything less than rock star producers, Burgundy remains a very tough sell in the marketplace. A number of producers and their importers were not ready to provide pricing yet on the 2010s. Why? Because there is still an enormous amount of unsold wine in the pipeline. That includes the 2009s. For all we heard about massive demand for the 2009s and the wines being sold out well in advance, that simply does not appear to be the case, again, with the exception of the most highly sought domaines. The reality is that village level wines sell through because they are affordable, while the Grand Crus sell because of their fame and tiny production levels. Beyond that there is a veritable ocean of great 1er Cru juice looking for a home. Savvy readers who buy wines to drink them will find plenty of reasonably priced wine in the marketplace, although it may take some work.